[UPDATE 2013-03-01] I have added links to the encoder chips these two remote use and removed some miss-assumptions for the Noru remotes. The explanation now is simpler, but the main questions about the Noru codes remain. 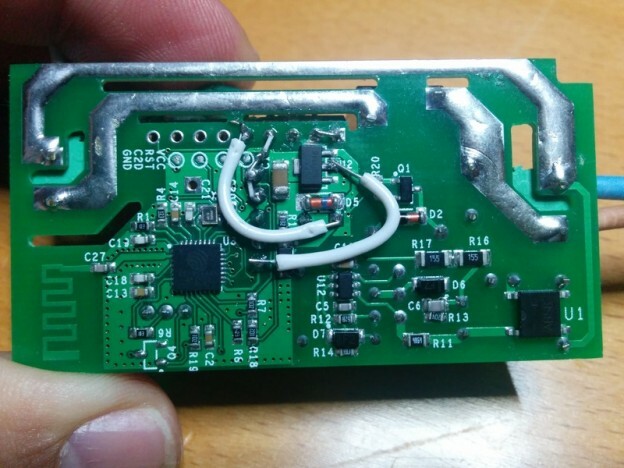 In my previous post I explained how I decoded the data from two wireless outlet remotes using a couple of libraries for Arduino and a Bus Pirate in logic analyser mode. Now I want to go more in-depth, showing the captures from OLS and the data I obtained. Just a little bit. These remotes send the information using a common type of modulation called Amplitude-Shift Keying (ASK). This is the digital equivalent to the Amplitude Modulation (AM) used in long distance radio broadcast. The information is encoded as an increase or decrease in the amplitude of a carrier wave of (in this case) 433.92MHz. The information itself is sent at lower frequencies (some tens of KHz). Note that you can speak these patterns in different ways: as a succession of pulse lengths, like “short long short long” or “1313” (the long pulses are three times longer that the short ones) for the tri-bit 0, or as a tuple of bits like “00” (1 for a long high, 0 for a short high). Now, the full signal is a series of code bits, a code word. 12 for the two remotes I have checked. These 12 code bits can be writen down as “11111FF0FFF0” (this is the ON command for outlet C in channel 31 for the Avidsen remotes). But this number is just a convenience and we are moving away from the actual signal representation. The first set of 5 are the channel (the one you configure in the dip switch of the remotes and the outlets). This is a value from 0 to 31 which is actually encoded in binary where the tribit 1 represents a 1 and the tribit F represents a 0. The second set of 5 tribits is the outlet identification you configure in the second set of 5 dip switches of each outlet. All the tribits in this set must be set to F except for one, which represents the outlet selection in the remote from A to E.
The last set of 2 tribits represent the action, and it can be “F0” for ON, or “0F” for OFF. With these information you can actually control up to 32*5=160 different outlets from your favourite microcontroller. This remote uses the HS1527 programmable encoder (datasheet). These chips have a hardcoded preamble of 20 bits (normal 0/1 bits) and 4 data lines to set 4 data bits. The total length of the message is the 24 bits. Mind these are normal bits: 0 is encoded as a short high pulse followed by a long low one whilst 1 is encoded as a long high pulse followed by a short low one. As you can see the first 20 bits are always de same. It’s the identification hardcoded in the HS1527. Only the four rightmost bits change. There are 16 possible combinations and 14 are being used by the 14 buttons (only the 00 and 11 endings are missing from the table). But, is there any pattern in this 4 bits? When you start using an outlet you first have to set it in learning mode and press the ON button in the remote for the number you want to assign to it. From then on the outlet will start responding to that button, but also to the OFF and SET buttons for the same number. So there has to be some pattern that links ON, OFF and SET buttons for the same outlet. According to the documentation an outlet can learn more than one code. The same code can be linked to more than one outlet and one outlet can respond to more than one code. I don’t know if this is somewhat useful to figure out the pattern but it’s cool! Some captures for a couple of Nero remote signals and enough for now. 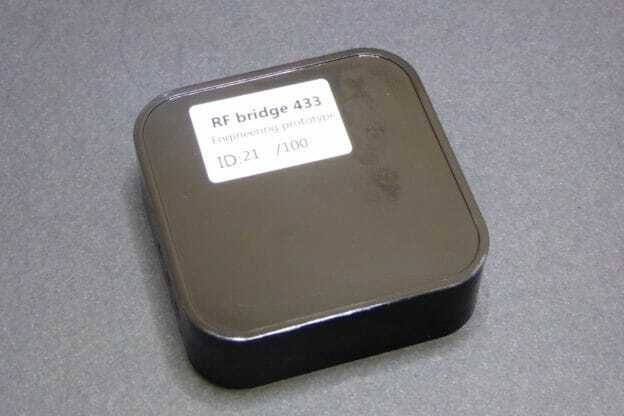 This entry was posted in Learning and tagged 433 MHz RF on March 1, 2013 by Xose Pérez. [Update 2013-03-01] I have added more documentation on the codes these remotes use in a different post. I’m starting to move towards not only gathering information but also acting. My first project in this subject will be controlling some lights and the house heaters. So last week I visited the urban market of “Els Encants” in Barcelona and bought some very cheap wireless outlets. I bought two sets of three wall plugs, each set with it’s own remote. They all transmit in the 433MHz frequency and I already had a set of transmitter and receiver for that frequency so as soon as I had some time I started trying to intercept and reproduce the codes the remotes were sending. In the image above you can see an outlet and the remote for each of the sets. The left one is branded “Noru” and each outlet is rated 3kW (good for the heaters) and it features auto switch off time (1, 2, 4 or 8 hours). The remote can control a maximum of 3 outlets and apparently it is programmable, since you first have to sync the outlets with the remote. The right one is branded “Avidsen”, also 433Mhz but rated 1000W, just below the consumption of my house electrical heaters, but good to control lights and other appliances. It’s got the very common dip switch to sync the remote and up to five outlets. There are 32 different channels available. So if your lights switch on and off randomly maybe you neighbour is using the same channel you are, then you better change the channel. I started reading documentation about the protocol these devices use and found out there is some very useful information out there. In fact there are even a couple of libraries for Arduino. The first one is called RemoteSwitch and it is a little old, it has not been ported to Arduino 1.0 but if you are like me you will keep a copy of Arduino 0023 just for this kind of situations. The second library is called RCSwitch and I have to say it is a neat piece of code. It has been ported to the Raspberry Pi, although the port is not as updated as the original Arduino library. My first tests with the RemoteSwitch library were encouraging. 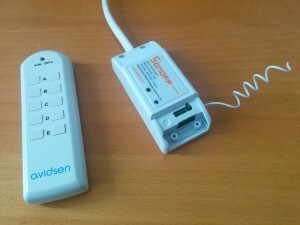 The Show_received_code sketch dumped the codes for the Avidsen remote one by one. I though: if it can decode it, it should be able to recreate it. And it worked from scratch. Good! Here was when things started to get complicated. The thing did not work. So I spent a couple of hours studying the code for both libraries, decoding the codes the RemoteSwitch library had dumped before and trying to find the difference. Until I found it: RCSwitch.cpp, line 239, that ‘0’ should be a ‘1’… and everything started working again. Very good! I started a thread in the library forum to find out whether this is a bug or a slightly different protocol. By the way, the protocol of these things is pretty interesting. It’s worth a look at Sui’s post to get an overview of the implementation. The tri-bit concept is really awkward. Then I moved to the other set of outlets. These are rated 3000W so I plan to use them to control my house heaters, which is the main reason for all this work. I followed the same steps, starting with getting the codes with the Show_received_code sketch. But weird enough the library was only able to decode some of the button presses… Only the SET button for outlet #1, the ON and OFF buttons for outlet #2, the ALL OFF button or the 2, 4 and 8H timeout buttons seemed to work. This time it was going to be harder, since I didn’t even have all the codes. Well, a good opportunity to use my Bus Pirate! Bus Pirate to the rescue! So I plugged the RF receiver to the Bus Pirate and launched the OLS Logic Analyser to capture the signal from the remote. You don’t have to configure anything to use the Bus Pirate as a (low speed) logic analyser. But since I wanted to power the radio receiver with the BP I had to enable the Power Supply mode. To do so you have to open a terminal session, type ‘?’ to get a prompt, select one of the modes that allow enabling the power supply typing ‘m’ and selecting the mode (like UART, for instance) and then type ‘W’ (uppercase to enable, lowercase to disable). Then you can close the session and it will keep the power on the 5V and 3V3 lines as long as it is plugged to the computer. Mind you have to free the port so the logic analyser software can use it. I had problems doing it with screen or minicom, but it worked great with picocom. After some tests with the Avidsen remote (I knew what the codes were so I could compare the signal output with the actual code) I started getting the signals for each and every button in the Noru remote. The image below shows the signal for the ON button for the outlet #1. The long pulses are about 3 times the length of the sort ones. The overall period is a characteristic of each remote. There is also a trailing high pulse followed by a long low which is called “sync bit”. Now the previous image for the ON#1 button can be decoded as 1F000001FFX0S. With a small patch I could make this work with the RCSwitch library. The library cannot create the code but you can feed it to the sendTriState method to generate the signal. And this is a sample code for Arduino that switches on and off outlet #1 every 2 seconds. Again, comments are more than welcome! This entry was posted in Analysis, Code, Learning, Projects and tagged 433 MHz RF, arduino, Bus Pirate, code, Logic Analiser, ols on February 28, 2013 by Xose Pérez.